The final member of the ice cream club shipment is a swirl sherbet from Wisconsin's Schoep's Ice Cream. This little guy is made up of lime-ish, orange-ish, and raspberry-ish flavored sherbets. Now isn't that a strange way to put it? Well, there's a reason. First off, this sherbet looks excellent in it's container. Sometimes sherbet can be hard to scoop, but not this one. It's soft and creamy-looking. The taste however threw me for a loop. The good news is that this isn't some cheap salty sherbet. 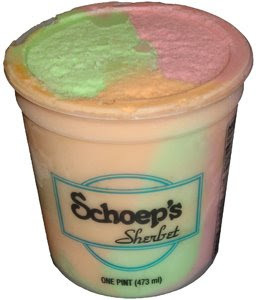 Schoep's is definitely going for a quality product here, but the end result is a sherbet that tastes muted. That's the best word I can think of. I started by trying each flavor individually and it's just odd. The texture for a sherbet is excellent, by the taste is just so....different. I don't know if watered down would be the right term. I'm conflicted between taste and texture, so I press on. I realize that as I keep going, I'm getting use to the uniqueness and speeding up the eating process. It's strange, but I don't think it's a bad thing since the result makes it goes down so smooth. It's a good thing I had something to go do otherwise I would have kept eating it (the dangers of eating from the container). Once again the ice cream club has given us another new perspective on frozen treats. Live and learn! On Second Scoop: Ahhhhhhh, nothing like the second scoop...a second scoop that saw me almost finish off this little unique pint of sherbet. I'm still tempted to call it weird, but I don't mean that in a bad way (honest). I was having trouble puts words to what I tasted yesterday, so again I studied each flavor and have come to the following conclusions: The orange is my favorite and reminiscent of a tasty cremescile. The raspberry could almost be described as a raspberry lollipop. The lime: well, honestly, the best description I can come up with is flat soda. Despite these unique descriptions, the sherbet continues to go down smooth and easy and there's just a small serving left.